For the next two years, Nyayo National Stadium will be boasting the Britam colours and branding in areas including the indoor arena, main stadium, VIP room, volley ball court, basket ball court as well as the stadium’s aquatic area. This is after Britam was awarded the rights to brand the 32 year old facility in a Kshs. 10 million deal with Sport Kenya after a competitive bidding process. 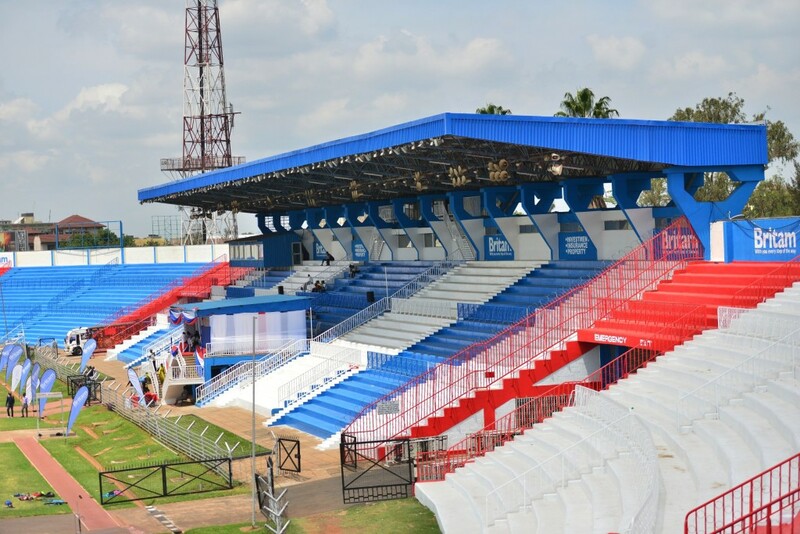 Nyayo stadium is a 30,000 seater facility located near the city center and is a natural venue of choice for local and international sports tournaments as well as national celebrations and other high profile events. In this partnership with Sports Kenya, Britam will be in a position to advertise its services and products and display them within the stadium, as well as get sales and marketing opportunities during events taking place in the stadium. Government was represented at the launch of the partnership which took place on April 15th with Dr. Wario saying that his ministry had put in place guidelines that would facilitate and encourage all stakeholders from both the public and private sector to work together for the betterment of sports in the country. Unlike in the past where attempts were made to rename the stadium in a branding deal by a soft drink company, Nyayo Stadium will not be changing its name this time this time. Also, it will also remain under the management and maintenance of Sports Kenya.